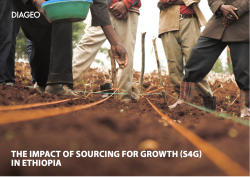 The Qualitative Impact Protocol was developed by BSDR and we have conducted studies across Sub-Saharan Africa, Latin America, Asia and the UK. Please take a look at who we work with for more information about the projects we have undertaken on behalf of clients. 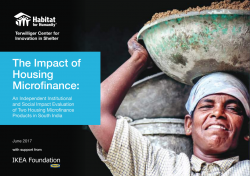 Example reports based on QuIP data by Tearfund, Diageo and Habitat for Humanity are available. 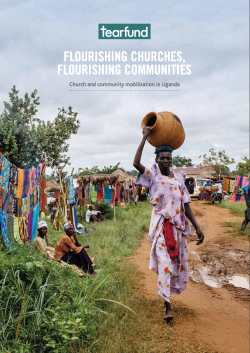 We have an extensive network of local independent researchers from academic and research institutions who help us to conduct high quality local fieldwork. Take a look at where we work to see where we have trained field teams. BSDR offers a range of consultancy, training and advisory services to support the use of the QuIP, ranging from full studies to supporting in-house teams to carry out studies. 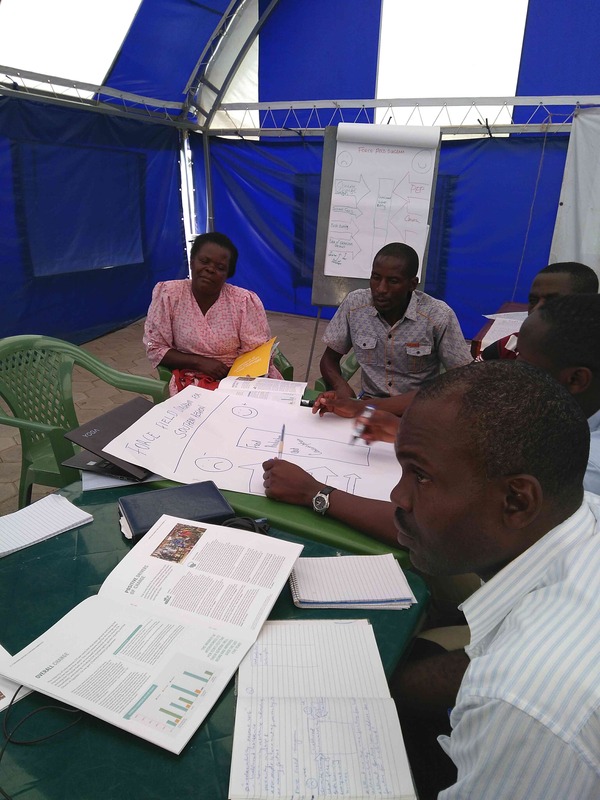 If you would like to commission a QuIP study, BSDR offers a consultancy service to carry this out from fieldwork to report and/or workshop stage, using trained and accredited field researchers, analysts and, where required, specialist consultants. Prices for these studies are bespoke so please contact Fiona to discuss further details. A supported study would initially be based on a consultancy contract, working with your organisation to establish how QuIP can be adapted for your needs. Once a study has been scoped out, a bespoke proposal can be put together including the relevant aspects of questionnaire design, local data collection, coding, analysis and reporting. The BSDR team also offers advisory and training services for those who are considering integrating the QuIP into their existing evaluation approach, or who want to carry out some or all of the QuIP study steps in-house. 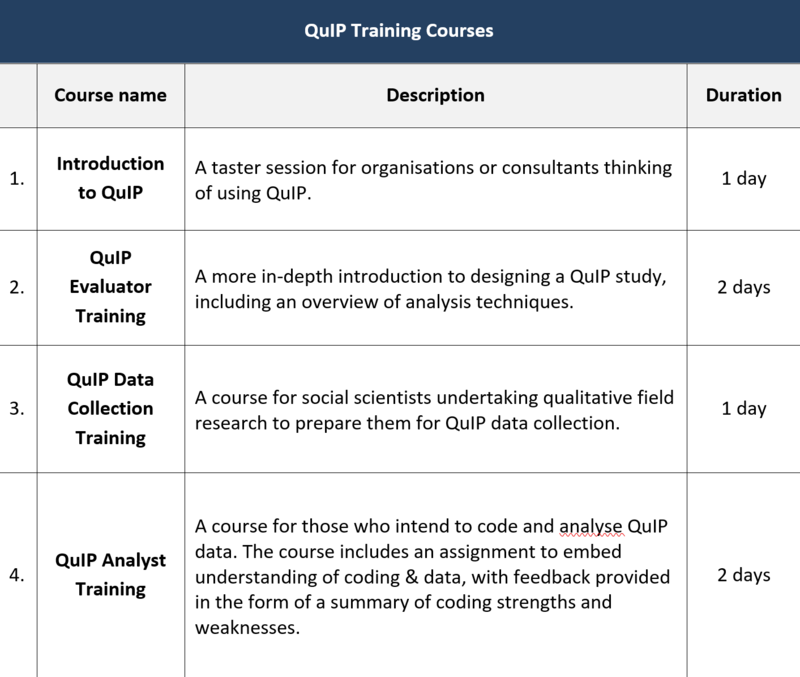 Those new to the QuIP are encouraged to participate in training before they embark upon a QuIP study. 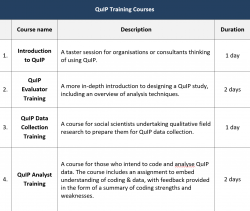 The level of training will depend on the extent to which they intend to be involved in QuIP studies (study design, data collection, analysis). If you would like to use QuIP within your organisation, please get in touch. BSDR has trained QuIP analysts who can offer coding and analysis services to consultancy projects where project management and data collection is conducted independently. Project managers must be QuIP trained and accredited in order to use this option since it requires them to lead on project design and data collection. Preparation of a bespoke data collection Excel spreadsheet, before data collection takes place, according to a questionnaire schedule provided by the project manager. One pre-coding handover day to understand the scope of the project and all required background documentation. Import of data from data collection to data analysis files. Coding in Excel according to the QuIP 5-step coding system. Half-day handover with project manager to agree on final tags and coding. Export of data to a Microstrategy dashboard. Half-day post-coding handover with the project manager to go through the dashboard and main findings. One pre-coding handover day with the project manager to understand the scope of the project and all required background documentation. Export and analysis of data in a Microstrategy dashboard. Preparation of a standard QuIP report, which presents relevant tables, data visualisations, respondent quotations and a basic narrative which highlights patterns and outliers.